In keeping with “all things new,” this month’s recipes take a new approach to reheating leftover food. Half-eaten sandwiches find a place at the breakfast table, and overwhelming portions of mashed potatoes are blended into a satisfying lunch for the next day. Even Halloween candy contributes to a delicious banana bread! 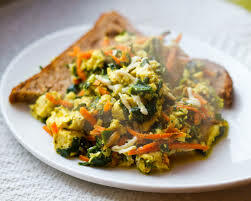 Recover the uneaten half of your sandwich from the Food 4 Thought Café in the Sackler Center by enjoying it for breakfast tomorrow as an egg scramble! Remove the sandwich contents, and scrape off any remaining condiments. Then, toast the bread in an oven, toaster oven, or pan with a little butter or oil. By the time your eggs are finished cooking, your bread should be toasted. Combine the two to make a sandwich, or enjoy separately! Thinking about a creamy and flavorful soup may keep you from finishing your hefty side of mashed potatoes. Try blending leftover mashed potatoes into a cream-based soup to add texture and flavor. Here is some motivation to not scarf down all of your Halloween candy at once. Roughly chop any candy corn or chocolaty candies (such as Snickers, M&M’s, or Reese’s Cups), and add them to your favorite banana bread recipe or mix. Michelle Borges is a first-year FPAN student from Raleigh, NC who even sees extra packets of salad dressing and other condiments as potential dinner ingredients.